The Grace Brethren seminary (graduate school of theology) in the Central African Republic is in the process of being relocated from Bata to the capital city, Bangui. Land has been secured, and the development has begun. 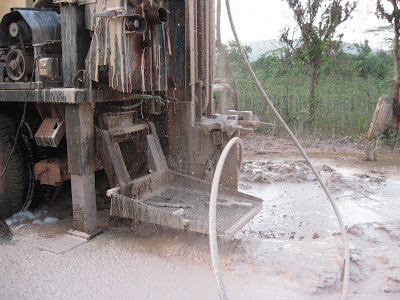 Jim Hocking, founder and CEO of ICDI, sends along this photo and message to announce that ICDI just finished drilling this well (pictured) and will be installing a Vergnet foot pump on this new well as the construction begins for the new seminary and training center just outside of Bangui. Living Water International helped to fund this well.